We are assembling quilts for disabled veterans, and need your help! Please pick up a quilt block kit from the Circulation desk here at the Library. 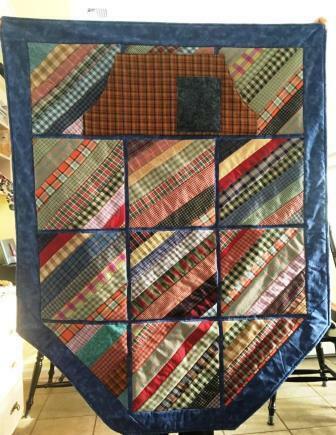 Once you finish your block, it will be combined with others' quilt blocks and assembled into a full quilt which will be donated to Disabled and Limbless Veterans, Inc. The finished quilts are angled at the lower corners to accommodate a wheelchair. This is a quick, fun project that will make a wonderful gift for our veterans in need. So far, we've assembled 29 quilts. Help us raise that number! Don't have a sewing machine at home? No problem! We have a sewing machine for you to use at Queset House on Thursdays in November and December, from 2-4 p.m.